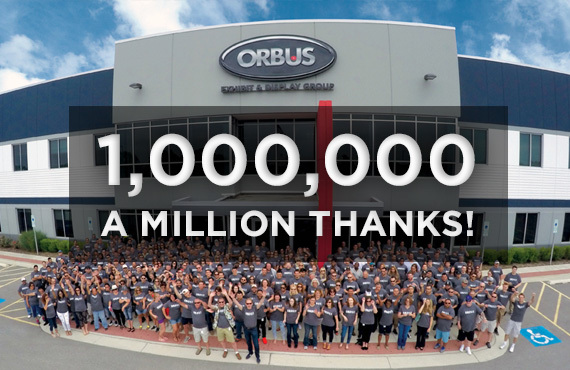 Woodridge, IL - August 27, 2018: Orbus Exhibit & Display Group®, one of North America's leading wholesale suppliers and manufacturers of display, exhibit, graphic and event solutions is excited to announce it recently achieved its one millionth order placement. The milestone was reached just one year after the company added state-of-the-art printing equipment to double its graphic print capabilities. Orbus Celebrates One Millionth Order Placed. For over 15 years, Orbus has been a pioneer in the exhibit and display industry. During that time, Orbus has grown and expanded with each year in both personnel and capabilities. Orbus employs over 400 full-time staff and in June of 2014, Orbus consolidated its two Illinois facilities to a 350,000-sq. ft. built-to-suit manufacturing and distribution facility in Woodridge, IL. It also has a growing operation outside of Las Vegas, NV, established in 2011.